TRANSITION: Next we will discuss situations which may require direct aid. 2. (5 Min) REASONS FOR AID. There are many situations, which a military climber may choose to aid, let's name a few. a. Above your ability. You conducted the cliff recon and picked a route, which appeared to be within your ability. Now you're 2 pitches up and stuck. b. Fatigue or Injury. The route may be a simple 5.6, but due to it being sustained 5.6 the entire pitch and not just one 5.6 move, you transition to aid due to fatigue. You take a lead fall on the second pitch and injure your arm or leg. As long as you have one good arm and leg you can continue on, utilizing aid techniques. c. Weather. You arrive at the cliff site and it begins to rain or snow. Aid can be accomplished with gloves on, even when wearing ski march or ice boots. d. Save Energy for Mission or Rescues. As an assault climber, conducting a cliff assault is just a means of crossing an obstacle, in route to the objective. Once your Company or Platoon is up the cliff, you still need the energy to continue on with the mission. In the event of a TRAP mission or high angle rescue, the real work begins once the casualty is down off the cliff, and must be carried to the extract zone. TRANSITION: Now that we have discussed reasons direct aid may be applied, are there any questions? Let's talk about some of the gear we'll be using. 3. (15 Min) GEAR FOR MILITARY AID CLIMBING. Some specialized gear is required for military aid climbing however; this gear can be constructed from the equipment a climbing team already possesses. The three minimum pieces of aid equipment are the Etrier, Daisy Chain and Fifi Hook. a. Etrier. Also known as Aiders. 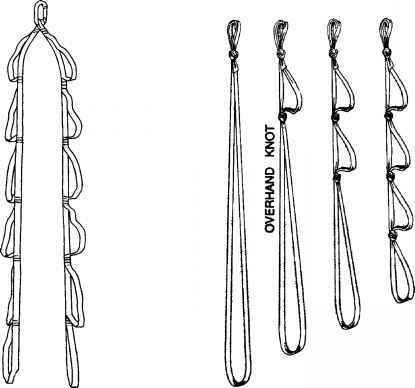 These are ladder like slings that allow climbers to step up from one placement to the next when they are clipped into a piece of pro. Etriers become your hand and footholds on otherwise unclimbable rock. The etriers can be constructed from an 18 foot tape or 21 foot prussic cord (tied in a loop with a square knot). At the top of the web/cord, tie a two-inch loop with an overhand knot. 10 to 12 inches down from the overhand pinch the two strands of web/cord together and pull up one side until it is offset enough for a comfortable step. Tie another overhand knot and repeat the process for the entire length of the web/cord. It is important to alternate which side is offset so that all the steps are not on one side. An 18-foot tape should provide 6 or 7 steps. b. Daisy Chain. 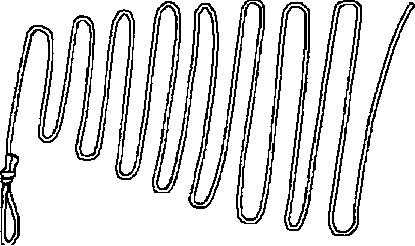 A length of webbing or cordage with clip in loops along its entire length used to connect a climber to a piece of pro. A daisy chain can be made from a 48-inch web runner. It is constructed in a similar manner as an etrier however; all the loops should be only 3 to 6 inches apart and on the same side. Keep in mind that the daisy chain should not extend beyond arm's reach. c. Fifi Hook. The fifi hook also called the "Arm Saver", is used by the lead climber to clip in short from his harness to the next piece of pro after ascending the etrier. This allows the climber to rest his arms while assessing the next placement and sorting through his rack. The actual fifi hook is not part of the MAC Kit but can be made by girth hitching a small runner to the hardpoint of your harness and clipping a carabiner to it. TRANSITION: Let's take a minute to look at the Aid Rack. 4. (5 Min) THE RACK. If you determined from the recon that an entire pitch or more of aid is necessary for the climb, you must augment the standard rack as necessary from the MAC Kit. In direct aid, you must find a placement every arms length, unlike free climbing where you have 8 to 10 feet or more to look for a good placement. This presents two problems, a massive amount of equipment necessary and getting used to moving upward on marginal placements. a. Amount of Equipment. The amount of pro necessary to complete a 50 meter pitch may be as much as 40 placements, and out of the 40, many may be of the same size. For this reason you must tailor your rack to the climb. Recon the route, focusing on the crack width, then draw the appropriate amount of chocks and cams suitable for the crack. You must consider the possibility of having to leave two carabiners per piece of pro, so now you are looking at 80 free carabiners. This does not include the carabiners used to clip your pro to the rack. To save some equipment you can bypass putting a runner on every piece of protection. Clip in two linked carabiners to the pro, the second carabiner acts as a runner where you clip the rope. b. Slings. Due to the weight involved with this much equipment it may be necessary to draw two padded racks. Sling them over both right and left shoulders and clip equipment to both racks and the climbing harness. TRANSITION: Now that we have discussed the gear required, are there any questions? Let's talk about the techniques used in military aid climbing.